Only the third known case of Capillaria hepatica infection in a horse has been reported, in an animal sent to a Japanese slaughterhouse. The parasite has a worldwide distribution and is capable of infecting humans and animals. However, infections in mammals, apart from rodents, which are its natural hosts, have rarely been reported. The case involved a three-year-old filly without clinical evidence of disease, who passed pre-slaughter inspections at a municipal slaughterhouse. Her liver was later found to have nodules up to 1.5 centimetres across with a mature, fibrous outer layer. Inside them were many barrel-shaped nematode eggs with a double-layered shell. They had the outward appearance of C. hepatica eggs. Nodules were removed and sent to the Equine Research Institute of the Japan Racing Association for microscopic examination. The eggs were identified as those of C. hepatica based on their form and structure. “To our knowledge, this is the first case of C. hepatica infection in a horse in Japan,” Akihiro Ochi and his colleagues wrote in a case report in the journal, BMC Veterinary Research. Just two previous cases have been reported in horses, in Britain and Canada. The liver lesions were similar to the Japanese case in both these instances. The life cycle of C. hepatica is direct. After the animal eats embryonated eggs, larvae hatch in the intestine and migrate to the liver, where they mature, breed, and lay unembryonated eggs. These eggs are not passed in the feces of the host but remain in the liver until the animal dies and decomposes or the host is eaten by scavengers or predators. After the death of the host, the unembryonated eggs are released into the environment and become infective and embryonated. In contrast, eating unembryonated eggs leads to a spurious, or fake, infection and the non-infective eggs are shed into the environment with the feces. The authors noted that a 2014 review identified 163 cases in humans, including 72 genuine infections, in humans in Europe, North and South America, Asia and Oceania, especially in tropical and temperate zones. 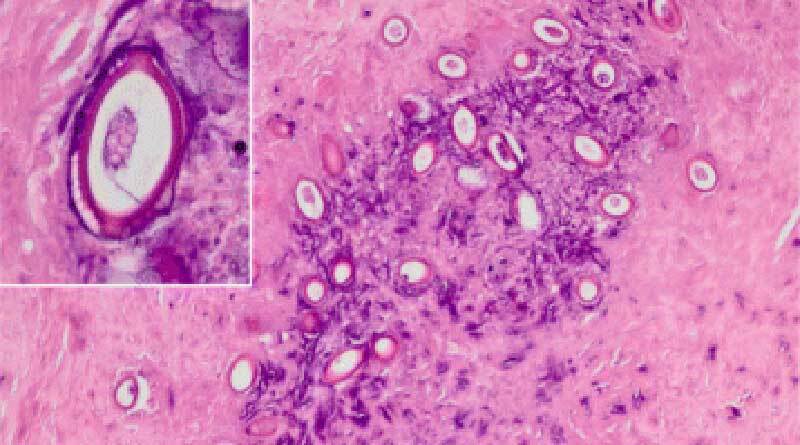 In veterinary medicine, the parasite has been found in at least 69 species, in 25 mammalian families. The case report was presented by Ochi, Takanori Ueno and Yoshinari Katayama, all from the Equine Research Institute; and Tatsuro Hifumi, from Kagoshima University.